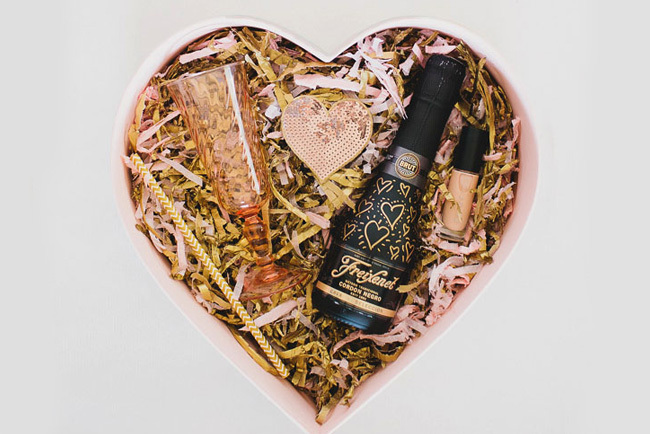 Asking your bridesmaids to stand by your side on the big day is a big deal, and we love the idea of making the experience fun from start to finish beginning with a creative way for “popping the question” to your most fave ladies! If you’ve been trying to think of the perfect way to do just that, you’re going to be pret-ty excited about today’s amazing giveaway from our friends + partners at Bijou Candles! 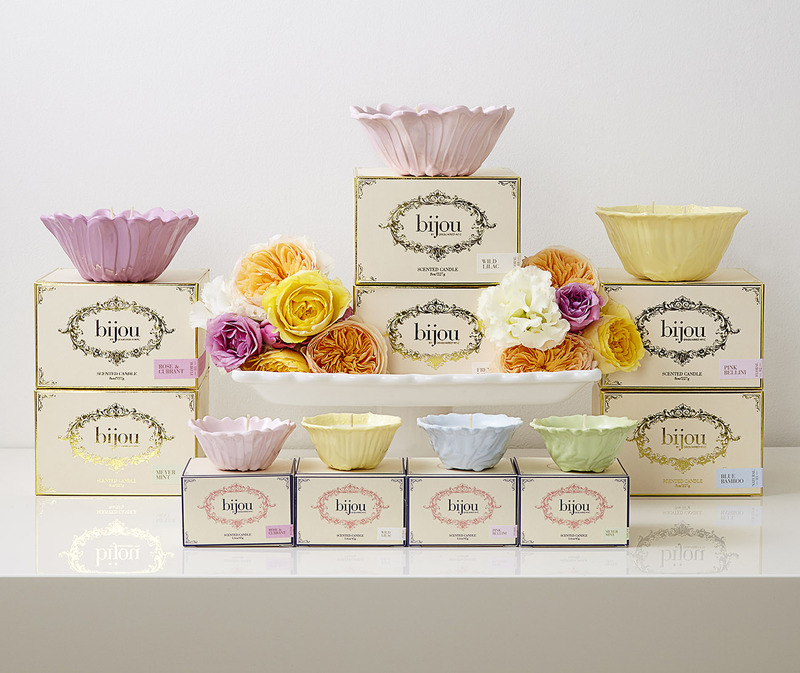 If Bijou Candles is a new brand on your radar, let us quickly catch you up to speed! Their company philosophy is to create a luxury experience at an accessible price, designing gorgeous products that are made to fit every lifestyle. Bijou Candles are the “complete package.” Each candle comes in an exquisite box with gold, hand-drawn illustrations. Not only do the rich and complex fragrances enhance your surroundings, but Bijou’s stunning Parisian-inspired bases truly adds to the room’s decor. How could you not be loving the sound of that?! 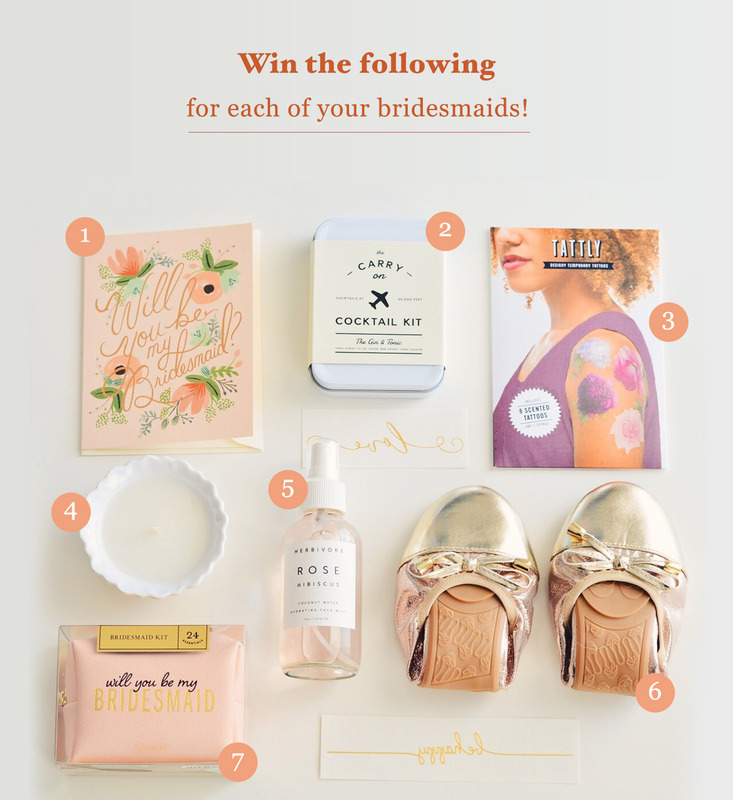 Bijou Candles has teamed up with six amazing brands — Talaria Flats, Herbivore Botanicals, Pinch Provisions, W&P Design, Tattly and Rifle Paper Co. — to help all of you brides-to-be ask your besties to be by your side on the wedding day! 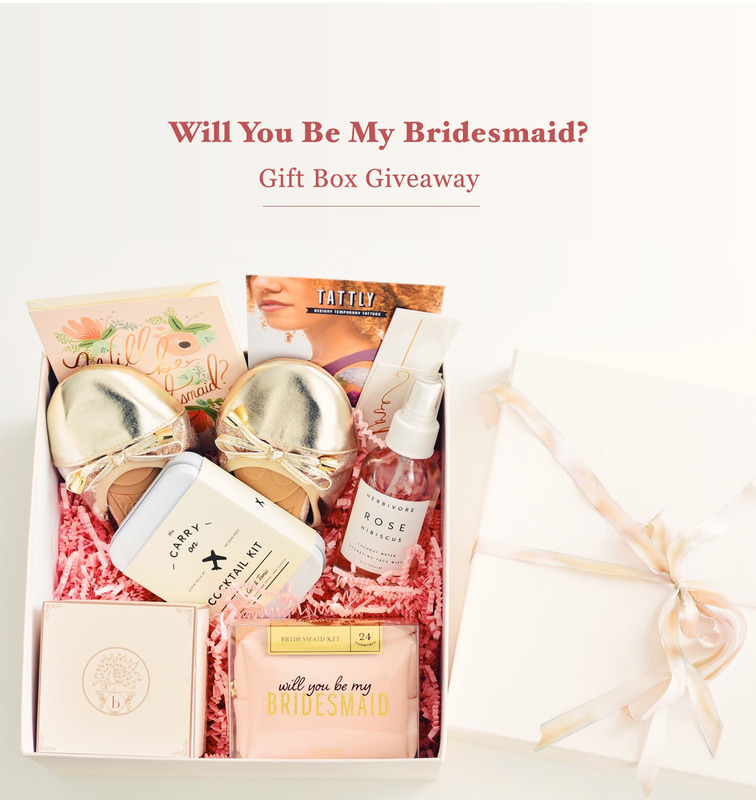 The (super lucky) winner will receive a gift set for each member of the bridal party (a maximum 6 sets) and we can’t wait to share more about what’s inside with you now! Inside each gift box is an array of stylish and decidedly feminine treats for your girls! Of course, (1) a card by Rifle Paper Co. to formally ask them if they’re up for the fun ride of being a bridesmaid, (2) along with a totally adorable mini cocktail kit, (3) scented!!! temporary tattoos, (4) a gorgeous candle from Bijou Candles, (5) a super lovely hydrating face mist, (6) flats to wear for dancing the wedding night away, and an (7) emergency day-of bridesmaid kit! 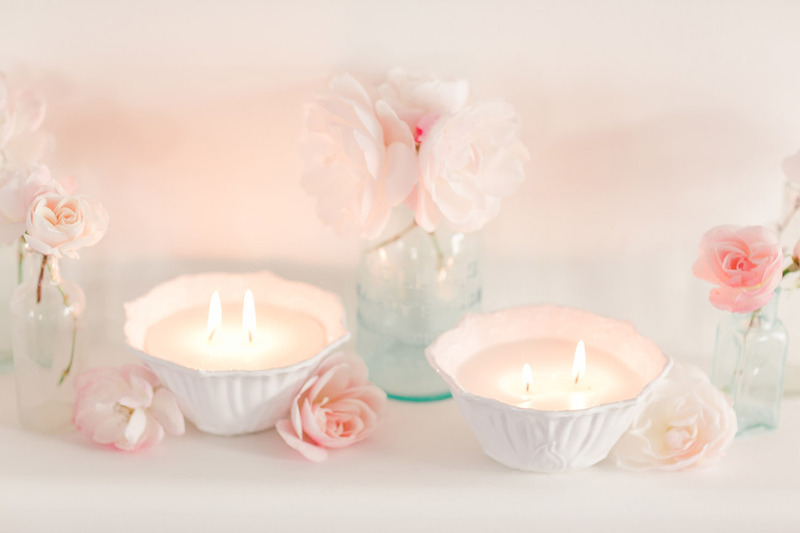 We love that a Bijou Candle can be repurposed by the recipient since you can change up the scents with a Bijou Candle refill or repurpose the bases any way you’d like. Bijou truly promotes the beauty of up-cycling and DIY and we just love that about them! Ready to enter? All you have to do is subscribe to Bijou’s newsletter here! If you are already subscribed, entering your email counts as one contest entry. For more chances to win, answer a bonus question for an additional entry (receive six bonus entries when you answer all six questions). You can also share your unique giveaway link and earn an additional entry for each person that uses your link. The contest begins June 2, 2016 and ends June 9, 2016. The contest winner will be announced on June 10, 2016 and is open to U.S. residents only. * This post is sponsored by Bijou Candles. Thanks for supporting our sponsors! Wow! These gifts are so beautiful! Thank you so much for the idea, I have been looking for suitable gifts for friends who are also the bridesmaids for my wedding in Florida(http://theaddisonofbocaraton.com/weddings-overview/)next month! And I think these would make a perfect gift for them!